Speck, sliced smoked cured pork. Whole pork leg cured with salt, herbs and spices and smoked over beechwood for a sweet flavour. 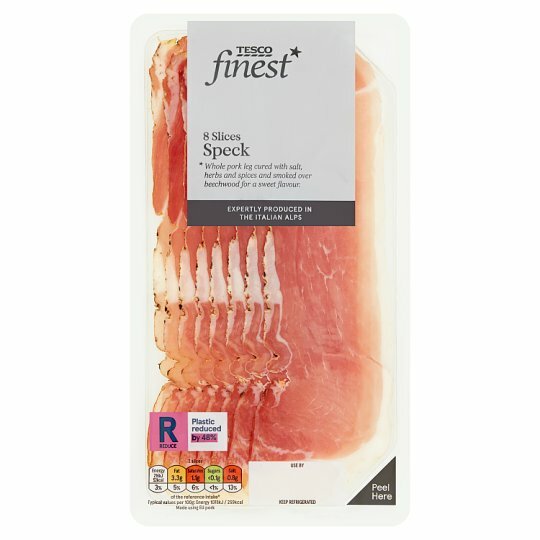 This perfectly seasoned speck is made in Italy by a family run company with 8 generations of expertise dating back to 1812. We have worked together for over 20 years to deliver authentic Italian flavour. INGREDIENTS: Pork, Salt, Spices, Dextrose, Antioxidant (Sodium Ascorbate), Fructose, Preservative(Sodium Nitrite), Dried Garlic. prepared from 152g of pork per 100g of Speck.